When Nadia’s family moves to Captive’s Sound, she instantly realizes there’s more to the place than meets the eye. Descended from witches, Nadia can sense that a spell has been cast over the tiny Rhode Island town–a sickness infecting everyone and everything in it. The magic at work is darker and more powerful than anything she’s come across and has sunk its claws most deeply into Mateo . . . her rescuer, her friend, and the guy she yearns to get closer to even as he pushes her away. Mateo has lived in Captive’s Sound his entire life, shadowed by small-town gossip and his family’s tormented past. Every generation, the local legends say, one member of the family goes mad, claiming to know the future before descending into insanity. When the strange dreams Mateo has been having of rescuing a beautiful girl from a car accident actually come true, he knows he’s doomed. Despite the forces pulling them apart, Nadia and Mateo must work together to break the chains of his terrible family curse, and to prevent a coming disaster that even now threatens the entire town, including Nadia’s family, her newfound friends, and her own life. 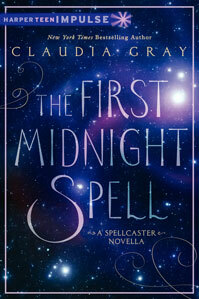 Shimmering with magic and mystery, New York Times bestselling author Claudia Gray’s new novel depicts a dark and unforgettable world of witches, curses, buried secrets, and star-crossed romance. 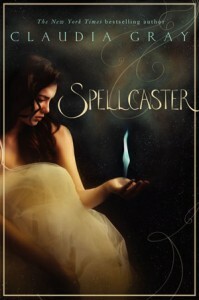 Get a sneak peek at Spellcaster! Someone strong enough to bear the curse. Someone who now could see magic at work in the world, both light and dark. Nadia’s witchcraft should grow even stronger now that her boyfriend, Mateo, is also her Steadfast – bound to her and empowering her magic. Yet the curse that torments Mateo has only intensified. Try as she might, Nadia can’t break the cruel spell on her best friend, Verlaine, outwit the sorceress Elizabeth, or stop a mysterious illness that’s striking people down one by one. And now a demon named Asa has joined the forces of darkness, playing mind games with them all. 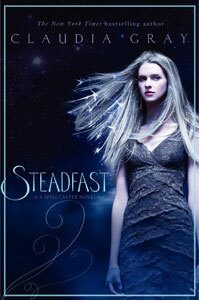 Nadia must gather all her strength to protect the ones she loves. But she is more vulnerable than ever to a darker power. The One Beneath has begun to call Nadia’s name, and Nadia must decide how close she’s willing to get to the darkness—before she can’t escape. To save the lives of countless people in Captive’s Sound, Nadia swore herself to the One Beneath—to black magic. 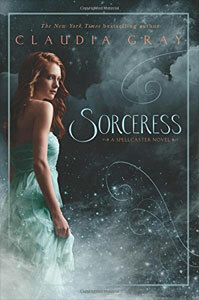 Her plan, and the town’s only hope, is for Nadia to learn enough sorcery to strike back against the forces of evil. But now that she’s separated from her friends, her family, and her Steadfast, Mateo, Nadia is more vulnerable than ever to the growing darkness. In this suspenseful companion novella to New York Times bestselling author Claudia Gray’s Spellcaster, learn the tragic origins of the dark witch Elizabeth. It’s 1695, and Elizabeth Cooper is a young witch in Fortune’s Sound, Rhode Island. She spends her days perfecting spells with the local coven and dreaming about one day marrying Nat Porter. But Nat is the son of Widow Porter, another witch and the leader of their coven. According to the First Laws of the Craft, Elizabeth is strictly forbidden to marry him.